A concoction of twelve stories, The Adventures of Sherlock Holmes Audiobook is the 3rd audiobook in the original Sherlock Holmes Audiobook Serie. It shadows the experiences of detective Sherlock Holmes, an enigmatic genius, as he tries to unravel the mystery of each investigation he partakes in. Set in late 19th century London, The Adventures of Sherlock Holmes Audiobook not only creates a successful mystery plot, but also circulates through real locations including Hyde Park, the river Thames, St George’s Church in Hanover Square, as well as adding fictional places to spice things up. The vibrant reoccurring illustrations of London’s means of transportation are also worth noting. 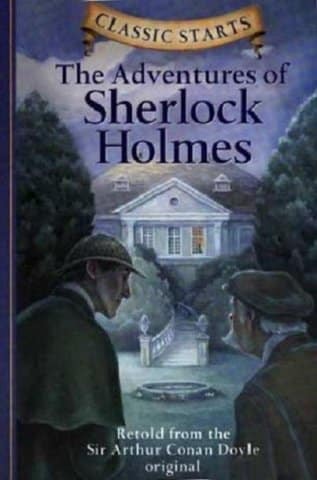 The Adventures of Sherlock Holmes Audiobook begins in the famous apartment 221B Baker Street, home to Sherlock Holmes who is visited by clients in need of assistance in resolving various issues. Unsurprisingly, Sherlock Holmes works his magic in order to find a logical solution to each mystery. Narrated from the perspective of Dr. Watson, Holmes’s close friend and companion, he serves as a monitor as he accompanies or is given a full account of the sequence of events surrounding investigation details. Watson then documents each adventure and shares it with the readers which in turn act as memoirs of Holmes’s achievements. This type of narration only enhances the sense of mystery surrounding each case because of the occasional missing detail and leaves the reader wondering about the next course of action. Interestingly, Holmes offers logical explanations for each of his solutions, but nevertheless manages to keep the audience on their toes. Family fortune, reputation, social status and moral weakness are just some of the themes Doyle explores in his novel of suspense and mystery.